The Platonic solids feature prominently in the philosophy of Plato for whom they are named. Plato wrote about them in the dialogue Timaeus c.360 B.C. in which he associated each of the four classical elements (earth, air, water, and fire, with a regular solid. Earth was associated with the cube, air with the octahedron, water with the icosahedron, and fire with the tetrahedron. There was intuitive justification for these associations: the heat of fire feels sharp and stabbing (like little tetrahedra). Air is made of the octahedron; its minuscule components are so smooth that one can barely feel it. Water, the icosahedron, flows out of one's hand when picked up, as if it is made of tiny little balls. By contrast, a highly un-spherical solid, the hexahedron (cube) represents earth. These clumsy little solids cause dirt to crumble and break when picked up, in stark difference to the smooth flow of water. The fifth Platonic solid, the dodecahedron, Plato obscurely remarks, "...the god used for arranging the constellations on the whole heaven". Aristotle added a fifth element, aithêr (aether in Latin, "ether" in English) and postulated that the heavens were made of this element, but he had no interest in matching it with Plato's fifth solid. Euclid gave a complete mathematical description of the Platonic solids in the Elements; the last book (Book XIII) of which is devoted to their properties. Propositions 13–17 in Book XIII describe the construction of the tetrahedron, octahedron, cube, icosahedron, and dodecahedron in that order. For each solid Euclid finds the ratio of the diameter of the circumscribed sphere to the edge length. In Proposition 18 he argues that there are no further convex regular polyhedra. Much of the information in Book XIII is probably derived from the work of Theaetetus. In the 16th century, the German astronomer Johannes Kepler attempted to find a relation between the five known planets at that time (excluding the Earth) and the five Platonic solids. 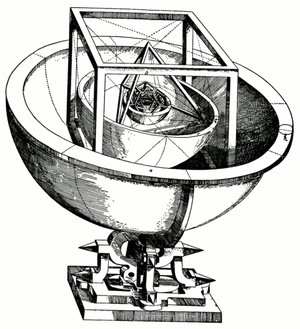 In Mysterium Cosmographicum, published in 1596 , Kepler laid out a model of the solar systemin which the five solids were set inside one another and separated by a series of inscribed and circumscribed spheres. The six spheres each corresponded to one of the planets (Mercury, Venus, Earth, Mars, and Jupiter). The solids were ordered with the innermost being the octahedron, followed by the icosahedron, dodecahedron, tetrahedron, and finally the cube. In this way the structure of the solar system and the distance relationships between the planets was dictated by the Platonic solids. In the end, Kepler's original idea had to be abandoned, but out of his research came the discovery of the Kepler solids, the realization that the orbits of planets are not circles, and Kepler's laws of planetary motion for which he is now famous. The illustration shows Kepler's model.